Last year I became a regular contributor to The Rouse, a business news and information site packed full of helpful articles on everything from technology, to marketing, to money. I write one article each month, and to date, they’ve almost all been around my favorite topic, email marketing. Here’s a roundup of those articles with links to the real thing! We start with the basics. Here are three simple things you can do to improve any email marketing program. Okay, so they’re not all about email. Here are my tips for how to get more out of direct mail campaigns, because they really do still work. Let’s talk timing. When you send your emails might have more impact on results than anything contained in the actual email. Want more people to open your emails? Here are five things you can do to improve the open rates on every email you send out. Maybe people are already opening your email, but not clicking. That’s okay, I have three tips for you too. What we don’t know about our email subscribers can hurt us. 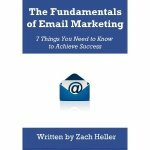 The more we know, the better we are at creating email programs that they’re looking for!